Smaller, sleeker and sexier – the big three design concepts that every manufacturer and company seems to be adhering to today when it comes to home and on the go computing. The old boxy computers that used to live beneath are desks (not to mention, take up entire rooms a generation ago) are quickly becoming relics of the past and being replaced by lightweight alternatives that busy professionals (like me) can toss into our backpack and bring with us wherever we go. The showdown now is no longer between desktop and laptop, but between two different takes on ultra portability. On the one hand we have Tablets, made popular by Apple, and on the other we have Netbooks. While both offer incredible versatility, are lightweight and not all that hard on the eyes, there are considerable differences between the two, which sets off this post. Let’s start with a look at netbooks this week, since they were, after all, here before the dawn of the tablet. Netbooks are essentially laptop computers designed to be as small and compact as possible. In order to minimize size and weight, quite a bit of of hardware gets stripped away during the design process. Because of this, netbooks have had a bit of a stigma, being known as a everything from a poor man’s laptop, to outright “worthless pieces of junk” (words of wisdom from a friend of mine). Though, many of the downsides are really just a matter of opinion. First off: netbooks do not have CD-ROMS, though that’s hardly much a big deal these days. In the age of digital downloads, flash keys and super fast networks, CDs have become a near obsolete way to transfer and store data. Why make a CD backup when you could make a DVD one or just use an external hard drive? And besides, who actually listens to music on CDs anymore these days? Retailers and the music industry are always complaining that CD sales are down, while the numbers of digital downloads are way up. Besides, how many laptops have you ever used where the CD-ROM wasn’t a noisy, clunky device? Leave the CD-ROMs for desktops. If you’re on the go, put a flash key in your pocket. Secondly: netbooks do not normally pack much of a punch when it comes to hardware. Serious video cards, ram and processors take space. The way technology works is that tech tends to shrink in size over time. Thus, in order to save space, older and smaller pieces of hardware are used. One of the reasons for this is because Intel happens to have a bit of a stranglehold on netbook technology, and places artificial limitations on many manufacturers, requiring them to provide similar, and often times quite low, specs to their machines. Dell’s netbooks are the prime example of this, as they all seem to follow the convention of having a single Gig of RAM, a pathetically slow processor and tiny little hard drives to boot. They even cut back drastically on the number of available ports for peripherals and accessories, which is a drag because netbooks largely need to rely on a variety of USB extras to get the most out of the experience, such as a mouse over a touch pad. 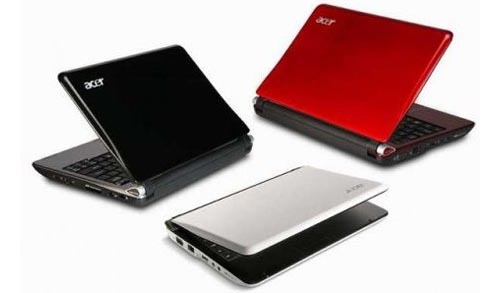 People looking for more power might notice that Acer often offers specs slightly above the grain (such as the netbooks depicted at the top of this article) but consumers should beware because Acer is essentially the Dynex / CCM / No name brand of the PC world. 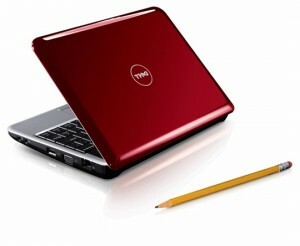 Luckily, other companies such as Asus have begun to work around the limitations placed upon netbook design. Asus offers notably more powerful netbooks, with more ram, dedicated video cards and even duel core processing, for relatively the same price. Though, they are slightly bulkier than the average netbook, they do pack more of a punch. Though, overall, don’t expect to run the latest games or render any serious 3D on a netbook. Because they are designed for professionals on the go, they are really catered towards office tasks, writing programs, simple programming and other things that busy professionals do. Third: With all this emphasize on saving space, some cuts to the overall audio and visual experience are inevitably made. Netbooks are tiny, and so are their screens. Most netbooks have screen sizes ranging from 8″ to 12.1″, noticeably smaller than even the tinier laptops out there. As well, while laptops are notorious for having poor sound cards and speakers netbooks are one step further in that direction. I own an Asus Eee PC, hardly a shabby model by any standard, and the sound is atrocious. Forget about hearing any bass in a song and explosions in movies sound like people crunching on a handful of almonds. Not exactly a home theatre experience by any means, though luckily many netbooks come equipped with an HDMI port which enables them to transfer sound and visuals to an HD TV. 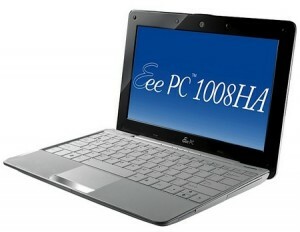 The netbook can then be used to stream programs from the internet, and play them on the television. Not a bad way of watching bad youtube videos on the big screen. Fourth: the keyboards can be quite cramped, notably on the smaller netbooks. Say goodbye to a numerical pad and wide open space for your typing hands; netbooks often have tiny keyboards. If you do a lot of typing, like me, this can be a bit of a nuisance. Though, thankfully, larger netbooks do have more realistic keyboards that can be as large as 90% of a standard keyboard. Though, at least they do have keyboards which is one thing that they certainly have up on tablets, in my opinion. I’ve been typing on keyboards for longer than I can remember, and I’ve come to realize that my hands have grown accustomed to not only the sound the keys make but also the depression when I hit each letter. Typing on a flat surface just isn’t the same. While tablets often simulate a typing noise, it sounds artificial because it is. Overall, we can look at netbooks as modern equivalents of typewriters, though far easier to carry. They have little power, few features, but at least they can go online and, if you’re a student, you can type up your essays on the go. Regardless of how tiny they are, they are still PCs, and get a few points for familiarity if anything.